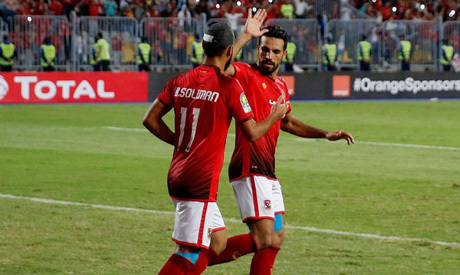 A wounded Ahly will be looking to return to winning ways in the Egyptian league when they face Smouha in an adjourned game at Alexandria's Borg El-Arab Stadium on Tuesday. Ahly slumped to their third league defeat this season on Friday when they lost 2-1 to Pyramids. The loss angered Ahly fans, especially since it came only one week after the team’s draw against Dakhleya. Ahly's poor results this season prompted the club's management to initiate a heavy recruitment drive in this winter transfer window in order to salvage the season. The team signed their former winger Ramadan Sobhi on a six-month loan from Premier League side Huddersfield before recruiting Angolan winger Geraldo. Wadi Degla's international midfielder Mohamed Mahmoud also joined the club, as well as Maqassa fullback Mahmoud Wahid. In a stunning affair, the 40-time Egypt champions completed the signing of Al-Ain Egyptian international winger Hussein El-Shahat on Sunday for up to $5 million, a club record fee. One day later, they signed Smouha defender Yasser Ibrahim to strengthen their defence. The first four-players were included in Ahly's 20-man list for the Smouha clash. Ahly's new coach Martin Lasarte, who took charge of the team last week, is yet to discover his squad and hopes to earn his first win with the Red Devils after losing his maiden game against Pyramids. Laserte has no striker at his disposal as team's Moroccan striker Walid Azaro picked-up a muscle injury that will sideline him for around six-weeks. International striker Marwan Mohsen will also miss the game due to automatic suspension, leaving the Uruguayan coach in duress. Ahly cannot afford to lose more ground in the title race. In fact, the Cairo giants will be in a must-win situation against the Blue Waves as the team sits in sixth place with 24 points, 17 points behind leaders Zamalek, who played three matches more. Smouha is also looking for their first league win since last October when they defeated Wadi Degla 1-0. During the past eight games in the Egyptian league, the Alexandria-based club were held in seven games and lost in the eighth. Team coach Tarek Yehya attributed his side's winless streak is due to bad luck, saying he believes that the team performed well in those eight games. Despite these poor results, Smouha still lie in eighth place on the league table with 23 points, a few points short joining the league's top four. Former Zamalek striker Basem Morsi, who joined Smouha on loan, appeared last week on the team list for Ahly's clash. On paper, the game will be tough for both sides as they have no chance to drop more points in the domestic league.